We are super excited to welcome the Theodoran family back to the Happy Film Company for the third time! Their first photo shoot with us was for their Seattle maternity portrait session at Alki Beach. Not long after, they were back for more with their Seattle newborn portrait photography session at their home with little Emerson. Now here we are with baby #2! Yippee! We moved all over their house during this photo shoot, taking advantage of their beautiful garden (I love those cute green chairs) and the gorgeous window light that was pouring in. 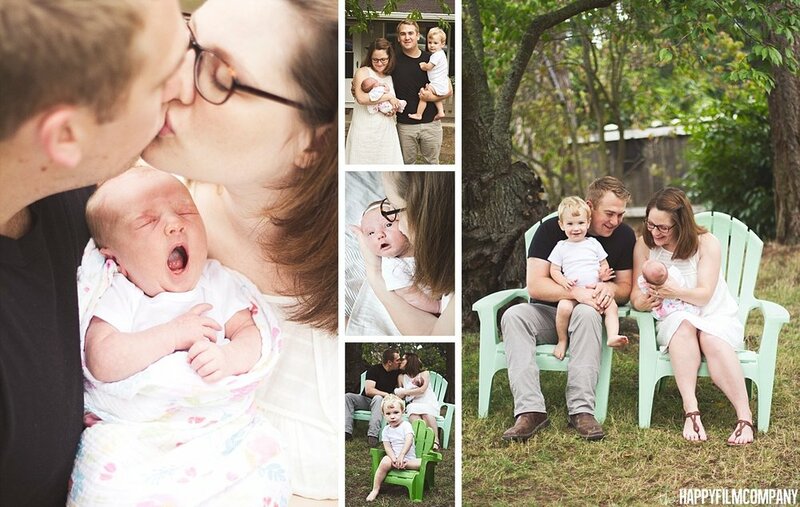 Their shoot is a perfect example of how to get variety in your at-home lifestyle newborn photography session with us. Before we arrive at your house, take a moment to pick out 3 to 4 spots. (1) We LOVE space by big windows: The windows give us beautiful dreamy and dramatic light. (2) Using the beds: The beds make it possible for us to get cuddling photos, and simple backdrops. (3) Sitting outside in the garden: Somewhere outdoors is always a plus because it means we have some greenery and room to run around and play. (4) Kicking up on the living room sofa: Finally, the sofas are a great place to capture a more traditional portrait and capture memories of how your home looked at this time in your life.